Daily Illuminator: Free Stuff At Warehouse 23! August 30, 2012: Free Stuff At Warehouse 23! The capsule machine was so popular at GenCon last year that we brought it back this year and stuffed it with even more awesome things. But the warehouse staff got a little carried away and filled so many capsules that we couldn't get rid of all of them at the con. So, we're giving them away at Warehouse 23! From 12:01 am on 8/31 to 5 pm on 9/4 Austin time, we'll include one randomly chosen capsule free for every $10 (before taxes and shipping) you spend at Warehouse 23. Get the Munchkin Skullkickers booster and the new Munchkin Jolly Jumbo d6 Gold Pearl Warehouse 23 exclusive - that's one capsule! Order a Heart of the Anomaly T-shirt and proclaim your geekdom for all to see? That's two capsules! Pick up a copy of Illuminati and take over the world? That's three capsules! Honor Cthulhu with your own Purple Cthulhu Dice Bag and your very own Christmas Chibithulhu - that's four capsules! What can I get from the capsules you ask? How about some cool, custom Munchkin and Pyramid dice? How about some new Munchkin Babes and Munchkin Pawns in nifty new colors? Need more? Ok. How about a whole new round of tournament-legal Munchkin rules (good until 12/31/12)? And the coup de grace - Munchkin coins dating back as far as 2008. Our craziness doesn't just end there. Oh no! (Blame Cthulhu. He ate our sanity!) 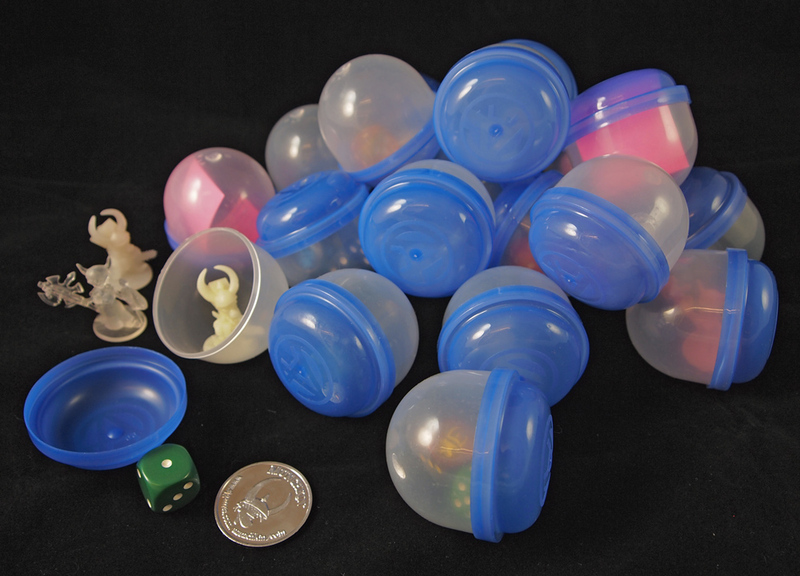 Spend $75 or more (before taxes and shipping) and we'll throw in a set of the not-yet-released Black and Light Blue Munchkin Jumbo d6s. That's right, FREE! Can't beat that! The capsules and dice are only available while supplies last, so you'll want to get your order in quick before these babies are gone!